We found it pretty hard not to like the new 2019 Mercedes-Benz A-Class, a sleek sedan and hatchback combo that seemed to really up its game over the current family of Mercedes compacts. But everyone had one question: where’s the AMG version? Apparently, this is it. 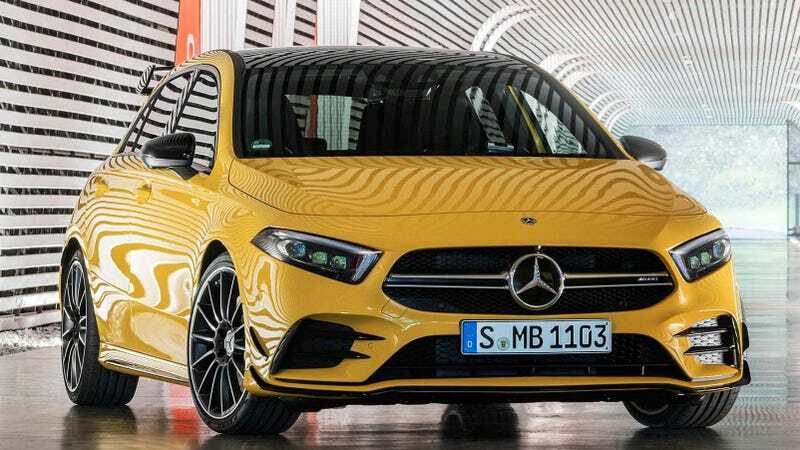 Meet the 2019 Mercedes-AMG A35 hatchback, which is set to debut in a few weeks at the Paris Motor Show but leaked early, as these things do, onto Australian car website Redline. It’s not confirmed that this is the officially official new AMG hatch, but those pics—complete with engine bay shots—sure look legit. According to Redline, the littlest AMG gets a 2.0-liter turbocharged four-cylinder putting out a Golf R-fighting 300 horsepower. Later a much hotter 400 HP version is expected, the site says, which would top the power on the current A45 and its platform siblings the CLA45 and GLA45. As with the current compact AMGs, power goes to all four wheels through a seven-speed dual clutch gearbox, and the new A35 AMG is expected to do zero to 60 in just 4.7 seconds. So even if you don’t opt for the upcoming hotter version, you’ll be plenty fast. There’s a raft of interior enhancements over the standard car too, including AMG sport seats, a leather and microfiber AMG steering wheel and metallic paddle shifters. Sadly we know the A-Class hatch won’t come to the U.S. But the A-Class sedan is coming here for the first time ever, and it will spawn a new somehow-different CLA and a money-printing GLA crossover. I’d be willing to guess some of those, if not all, will get AMG variants down the line. In the meantime, this looks like a fun addition to the hot hatch world if you can get your hands on it. Expect more when the car drops for real in Paris.